What is a good moveset for Passimian? 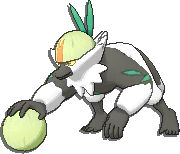 If you have a good moveset for Passimian, post an answer below and upvote the best ones. Remember, this is for competitive movesets, not in-game. Ability, EVs etc should be included, and we encourage sets for VGC doubles as well as singles. Make sure to read all the guidelines here. Passimian Pokedex & learnset for reference. Explanation: Yes I'm aware Defiant isn't available for Passimian yet but it can easily switch into Intimidater like Gyarados. U-Turn is Psychic type coverage and it can be used for Scouting. Iron Head is Fairy Type coverage and has a Chance to make the Foe Flinch. Rock Slide is Flying Type coverage and it also has a Chance to make the Foe Flinch. Close Combat is Power and STAB. Defiant allows you to switch into Defog users and Intimidate mons. With scarf and jolly, you have a fun time outspeeding many stuff and OHKOing them with +2 Attack you get from defiant. Receiver can be used in doubles to get a good ability from your partner. U-Turn is necessary for those who knows it lol. Gains valuable momentum. Okay, this is super gimmicky and situational, but it’s pretty fun if you can pull it off. This entire set solely relies on Passimian getting its Attack stage lowered via something like Intimidate, after which, it’ll end up with a +1 in Attack and Speed to sweep with. Close Combat is your strongest physical STAB, and the rest give you a nice total of 666 Pokemon that get hit Super Effectively. Also can’t hurt to have Sticky Web up since Passimian’s Speed is just average. I chose Modest because he has decent physical bulk and he needs every Special Attack boost he can get. You could also run Timid with 252 Spe. Choice Specs boosts your dreadful Special Attack. Focus Blast is strong STAB. Energy Ball and Shadow Ball give coverage. U-turn would get a boost from Defiant and works well with Choice Specs. HP Ice is usable but Focus Blast usually hits harder. Use "Fling" with "Rare Bone" =100 Base power. Lets you use Acrobatics at full power. Gunk Shot or Iron Head for fairy coverage. Drain Punch or Close Combat for stab. Bulk up raises his/her Att and Def by 1 stage. Close Combat/Superpower has 120 base power, 100 Acc. but lowers Def and Sp. Def/Att and Def by 1 stage. U-turn prevent from stalling and help passimian from any psychic/flying/ghost type Pokemon. Finally, Iron head for flinch And Earthquake for nice damage. What is a good moveset for Alolan Raticate? What is a good moveset for Alolan Persian? What is a good moveset for Drampa? What is a good LC Moveset for Bounsweet? What is a good moveset for Alolan Dugtrio? What is a good moveset for Oranguru? What is a good moveset for Comfey? What is a good moveset for Bruxish?